"Contrary to what their own propagandists and many in the media contend, social conservatives continue to have great influence and vast resources to pursue their agenda. They have stamina, resources and, increasingly, the infrastructure to wage their campaign over a long period of time — perhaps, as REAL Women notes, for several decades. Most importantly, social conservatives have, at least for the time being, a fellow evangelical as prime minister and, in the Conservatives, a governing party in which evangelicals are disproportionately represented. 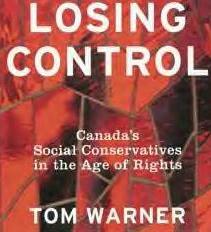 The Harper government’s election in 2006 and reelection in 2008 were undeniably historic — and reason enough for evangelicals to be optimistic about the future."